I am setting up a hectare grid in QGIS 3.0 using Vector > research tools > create grid > grid type:point and then defining boundaries by a preexisting polygon layer. I would like to get coordinates from these points but the x and y axis created seem to be defined not by the CRS but by seemingly arbitrary numbers. Is there a way I can get coordinates into the attribute table? 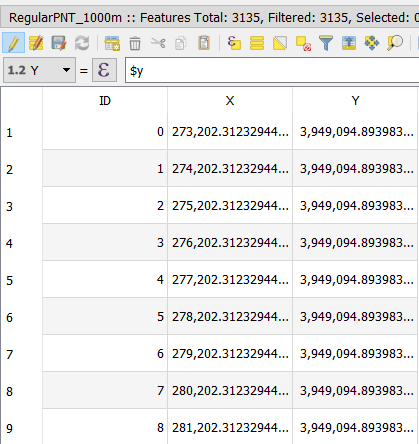 When I identify feature, I can find the actual lat/long coordinates but I cannot figure out how to import these into the attribute table. Not the answer you're looking for? Browse other questions tagged qgis vector-grid or ask your own question. Compute coordinates of vector line?